Wyatt has landed in prison facing serious time after he is framed for a crime committed by his friend. When a man named Hallsy shows up and offers him a chance to leave the jail and wipe his record clean, Wyatt takes it. 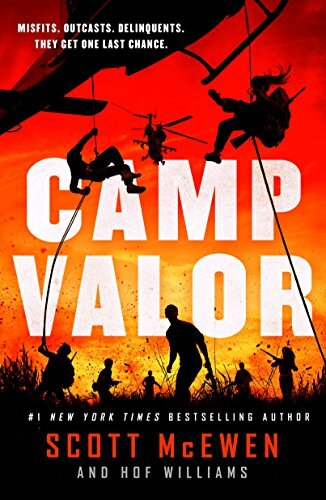 He is taken to a top secret summer camp where he will be trained to become an elite military operative along with many other children and teens. Assuming, that is, that he doesn't quit first. The people who make it through the exhausting training at Camp Valor are sent to infiltrate situations that would impossible for adults. In fact, in 1984 a Camp Valor graduate killed a central American despot by befriending his son. Unfortunately, that son turned his father's death into a reason to track down his killer and has become one of the most powerful underground figures on the Dark Web. Now his revenge mission and Wyatt's training are about to collide. Somewhere I read something about this book that made me excited to read it before it was published. Then last week I was on vacation and ran out of things to read when I found a copy at the local bookstore. I tore into it excitedly and was quite absorbed for awhile, thinking about how much my students would really like the military and action aspects of it as we see Wyatt enduring the brutal training. Then, it began its slow, horrible descent into graphic, disgusting violence. The book tells parallel stories until they intersect in the last few chapters. I had no problems with Wyatt's timeline of training at Camp Valor (except for the romance which felt forced and added in just to be a plot point that led to another big event) even though if I think about it I guess it's pretty odd to have 11 year olds with stuffed animals defusing bombs and learning weaponry. But it's an adventure book and she was a secondary character so I didn't dwell on that. The main thing I DID dwell on in Wyatt's training storyline was the pill you had to take to wipe your memories if you tapped out - surely you had to take a different pill if you quit during Hell week as opposed to those who gave up in the first day? Just my own internal musings about the logistics of the memory wipe pill... Even though the teens at Camp Valor are learning to use all sorts of weapons, their scenes were not graphic or inappropriate for students. No, the problem I had was with the other story of the Glowworm, the disgusting creature who used to be the despot's son. Even the description of his appearance and smell is pretty bad but that's nothing compared to his eating habits - completely gratuitous - and violence with those who disappoint him. In addition, there is his right hand assassin, Raquel, who attracts the Glowworm's attention when she kills some tourists because they photographed her eating her meal. When the two plot lines finally match up then the violence and killings ratchet up as well. The imagery in this book was so graphic and disturbing that I had to put it down one night before bed because it was making me uneasy in my own home. Aside from the violence, I take issue with the way the Camp Valor team handled their mission with Raquel and the Glowworm. It felt like a couple members of the team basically ignored all their training and protocols which led to a lot of death and injury. I don't remember ever doing this with any other book I've purchased for my collection, but I'll be passing this one on to a high school rather than keeping it on my shelves.